William Macewen (1848-1924) was a Scottish surgeon who was a pioneer in modern brain surgery. He also contributed to the first development of bone graft surgery, the surgical treatment of hernia and of pneumonectomy (removal of the lungs. Macewen was born in Rothesay (Isle of Bute, Scotland) in June 22, 1848, and got his medical degree in 1872 at the University of Glasgow. He was greatly influenced by his former teacher of surgery, the great Lord Joseph Lister (1827-1912), who revolutionized surgery by developing antisepsis, by the use of phenol, thus decreasing drastically the enormous mortality of surgical patients due to infections. By following Lister and adopting systematically the use of scrubbing? (deep cleansing and desinfection of hands and arms), sterilization of surgical tools, use of surgical gowns, and anesthesia (which was also recently discovered)), Macewen became one of the most innovative surgeons of his time and was able to greatly advance modern surgical technique and improve the recovery of patients. In 1875 he became an assistant surgeon at the Royal Infirmary, Glasgow, being promoted to full surgeon in 1877. From 1881 to 1889 he was a lecturer at the Royal Infirmary School of Medicine, and later on a Professor of Clinical Surgery. On this appointment he had to transfer his surgical activities from the Royal to the Western Infirmary. In 1883 he was appointed as Surgeon to the Royal Hospital for Sick Children in Glasgow. He also helped to found in 1916 the Princess Louise Scottish Hospital for Limbless Sailors and Soldiers? in Erskine (now the Erskine Hospital, near Glasgow, which was urgently needed to treat the thousands of military that lost their limbs in the First World War. Macewen was its first chief surgeon and he designed the Erskine artificial limb with the help of engineers and workers of the nearby Strathclyde shipyards, and trained a team of pattern-makers to manufacture them for the hospital. Following the work of John Hughlings Jackson and David Ferrier on neurological mapping of functions in the brain, Macewen demonstrated in 1876 that it was possible to use a precise clinical examination to determine the possible site of a tumor or lesion in the brain, by observing its effects on the side and extension of alterations in motor and sensory functions. Thus, in 1876 he diagnosed an abscess in the frontal lobe of a boy, but the family refused permission to operate. When the patient died his diagnosis and localization were found to be correct. He performed the first successful intracranial surgery where the site of the lesion (a left frontal meningioma) was localized solely by the preoperative focal epileptic signs (twitching of the face and arms in the opposite site of the lesion). On the basis of these signs Macewen thought that there was good evidence of an “irritation to the lower and middle portions of the ascending convolutions…in the left frontal lobe”. A trephined hole in the skull near the purported site of the lesion showed a big subdural tumor. The patient, a teenage girl, lived for eight more years, and a subsequent autopsy showed no trace of the tumor. He later used this many times to succesfully operate on brain abscesses (in 1876) and hematomas and on the spine. This was a great triumph of medicine. According to one of his biographers, "his thorough knowledge of the natural history of pyogenic diseases of the temporal bone and nasal sinuses?, in addition to his clear description of cranial anatomy, as illustrated in his Atlas of Head Sections, were especially important in developing his successful treatment of brain abscess. The x-ray had not yet been discovered; Macewen's diagnosis was based on clinical findings superbly illustrated by his three clinical stages of brain abscess development" (Canale, 1996). Another important contribution by Macewen to modern surgery was the technique of endotracheal anaesthesia with the help of orotracheal intubation, which he described in 1880, and still in use today. Macewen was noted for his early and creative use of photographs for documenting patients cases and for teaching surgery and medicine. He pioneered the use of photos of body parts and pathological specimens, as well as photos taken before, after and during treatment/surgery. In 1892 Macewen became Regius Professor of Surgery at the University of Glasgow (the post which Lister had held when McEwen was a student) where he remained until his death, in Garrochty, Isle of Bute, in March 22, 1924. Macewen became a Fellow of the Royal College of Physicians and Surgeons of Glasgow in 1874, a Fellow of the Royal Society in 1895, a Honorary Fellow of the Royal College of Surgeons of England in 1900, and the president of the British Medical Association in 1922. He was knighted in 1902. 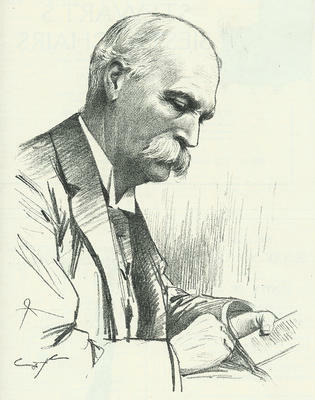 Sir William Macewen (1848-1924). University of Glasgow, Scotland. Canale, DJ: William Macewen and the treatment of brain abscesses: revisited after one hundred years. J Neurosurg. 1996 Jan;84(1):133-42. There is a beautiful description of a brain surgery carried out by Macewen around 1918, by the famous British writer and physician A.J. Cronin in his autobiography Adventures in Two Worlds, pages 9-12 (McGraw-Hill Books, 1952).